Announcement 🌟FOLLOW ME 🌟 Facebook or Instagram (@letteringbygrg) and take a peek at our latest work! Please allow 5–7 weeks for the Stationery process to be designed, printed, assembled and shipped. Once we receive the information suites, we aim to have a design draft within 3 business days. We allow for 2 rounds of revisions as standard. Changes can include Text, Sizing, Composition, Alignment, and Coloring. If there’s anything you’d like to modify – just let us know and we’ll make it happen! As part of our process, we’re also able to add custom Watercolor Designs and Vector Sketches. Typically it can take from 5-15 business days to complete the design, depending on the type and the level of detail. This can take up to 15 -20 Business Days. 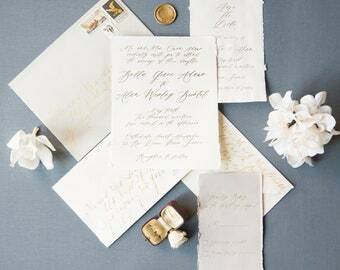 Hand lettering on Envelopes can take 10-30 Business Days, depending on quantity and complexity. We do this process parallel to the printing, and will advise you well in advance so you know exactly when to expect your Wedding Invitations! 🌟FOLLOW ME 🌟 Facebook or Instagram (@letteringbygrg) and take a peek at our latest work! LOVED my wedding invitations. I ordered the sample packed and was in love with all of their work. About a week later I started the process with them for my wedding invites. They're very friendly and the whole process was smooth. 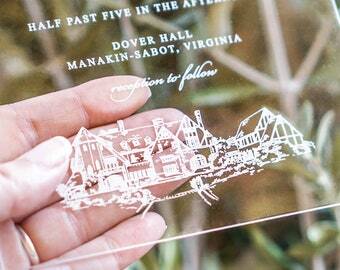 Everything looks amazing and all my guest love the acrylic invites and say its a very unique invite, worth keeping. Definitely makes a statement. Beautiful vow books! So happy to incorporate these on our special day. I just love when couples share photos of their big day with me! Katie and Greg got married last May. Hi, I'm Monica! I am a true romantic at heart and I absolutely love Design! I'm a Spanish lady, living in Ireland and married to an Irish gentleman. Letterpress, Velvet, Jellies, Kittens and Tea are my passions. 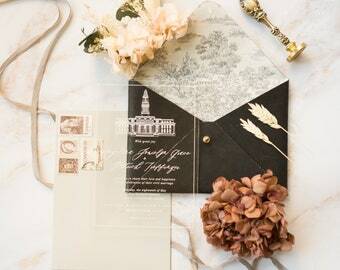 Do you offer Wedding Stationery samples? Yes. We love when our clients have sample-sets in their hands. It’s one thing to see a design on-screen, but it is another thing entirely to have the actual Suites in your hands and to be able to feel the texture and quality of our products. However, we do not provide custom-printed samples. We find that any preliminary work we do is always radically different from the finished product. In addition, it wouldn't be economically viable to only print one set. I found a typo on my stationery, what do I do? Your stationery will be printed exactly as shown on the approved proofs. Should you find an error on your stationery, please contact us. We offer a discounted reprint and complimentary rush service for customer approved errors. Delays during the proofing process will push out the shipping and therefore the delivery date. - Europe: 3 - 5 Business days approx. - United States: 5 - 7 Business days approx. - Canada and Rest of the World: 7 - 10 Business days approx. These times can vary according to weather, holiday seasons, etc... and are intended as guidance only. Express and/or rush orders are available upon request please note this will carry an additional fee. Can you printing my Design / 3rd-party Design? As we're a Design Studio and not a print-house - we don't accept 3rd party designs for printing. This is for 2 reasons: the first is that with any designs that we don't create ourselves, we can't guarantee that they've been created to the high standards necessary for our printing methods. Secondly, we don't use third-party designs as we're unable to legally verify if we have a commercial license for use. In order to work out how we can help you best, we’d love if you could fill out this Contact form for us: https://goo.gl/forms/RbrLVfLfJLlGlbgO2 . Its not too long, we promise! -This may delay the delivery from 1-5 business days. Unfortunately this process is entirely beyond our control. We cannot falsify customs declarations or otherwise incorrectly declare the contents of the package in order to circumvent this process. Typically our Stationery is classified as ‘merchandise, not for resale or redistribution’ – and usually does not levy a Customs fee. However, this can vary.